Didik Wahjudi (far right) and his colleague Christine Wonoseputro (second from left) at the United Board office with United Board staff Louisa So (far left) and Hope Antone (second from right). 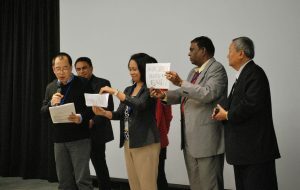 Dr. Wahjudi (with microphone) participated in the United Board’s 2014 Strategic Planning and Resource Development workshop. Dr. Wahjudi offers advice to others who, like him, are newcomers to fundraising. “It’s important to have a good cause or project to offer donors,” he said, and fundraisers may want to present two or three projects, of different scales, so that donors can select a project that reflects their own philanthropic interests. It’s also extremely helpful to turn to other institutions for advice and models that can be adapted. At a more fundamental level, Dr. Wahjudi urges fundraisers to look to the community they serve. “Make students love their university and alumni love their alma mater,” he advised. That’s an approach that can unite leaders, administrators, faculty, and fundraisers in a shared mission with lasting benefits.